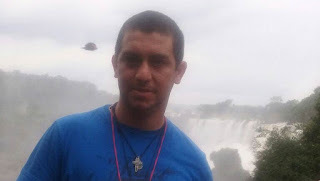 Alejandro Blanco is a 36-year-old resident of La Plata who believes he has come across something much more shocking than one of the world's wonders during his trips to the Iguazú Waterfalls. According to his story, after being photographed with the spectacular natural marvel behind him, he discovered the presence of an object that he believes could be a UFO. "It's incredible. It surpresied me because I'd been looking in that direction without seeing anything. I turned around so a girl could take my picture and then I found this, which I consider to be a flying saucer." Convinced that he had witnessed a genuine event, Blanco added: "It reminded me of the movie Predator, in which the monster would appear and disappear. Something similar happened here. There was nothing at first, then this." The man, who worked up to only recently as a sanitation engineer and who retired early due to physical issues, explained that he had journeyed to Misiones Province with his mother on a typical sightseeing trip. At some point he thought it was a prank. "Since you can now add things to photos in a cellphone, I thought it could've been a prank, but the fact is that there's no way it could've happened. It's a major mystery," he said. This journal contacted Luis Burgos, the renowned ufologist from La Plata who has studied the UFO phenomenon for decades. Following the analysis of the photo through a variety of image filters, he stated that the image did not match what is normally thought to be a flying saucer. "Confusions of this sort are commonplace, but I'm 100% sure it's a bird," he said.